Powder bath rooms generally drive me crazy. Not the ones in my projects (obviously) but the generic ones I see when I go into older homes or the new builder homes of my friends *cringe*. I need to ask you to assume that I am not a design snob and that I don’t judge people who love their home – different strokes right? But I am begging you designers to stop putting a toilet by the front door!!!! Seriously … you do know what is supposed to happen in those rooms right? I also have some other peccadilloes that are sure to earn a designer a big fat X in my book. The biggest one is when I see a custom designed, expensive, new bath room … and the sink gets placed next to the toilet. 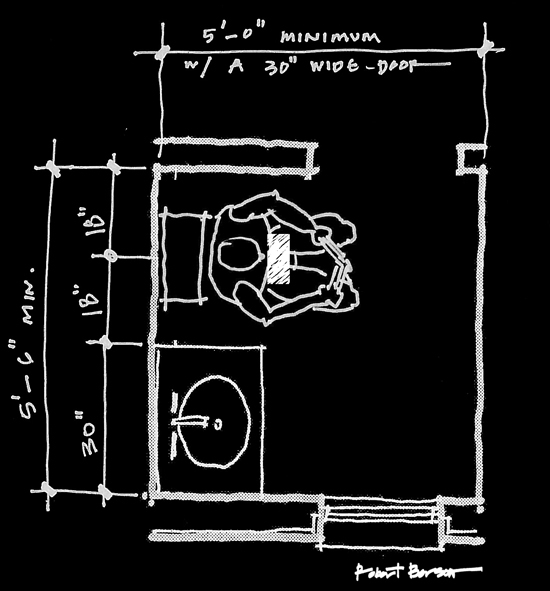 Since we are a visual bunch, I prepared a floor plan sketch of the bathroom that greets me when I walk into 99% of all traditional homes. For those with a weak constitution, I have employed a crowd favorite – the modesty crotch panel – so feel free to safely continue reading and evaluate the sketch. This is a far better layout in my opinion. You can actually design this room with less space while making it feel far more spacious. Another benefit is that you can locate the toilet paper roll on the right hand side of the toilet so the user doesn’t have to be a contortionist while twisting around to reach the roll. FYI, the toilet paper roll is most comfortable when located even with the middle of the toilet bowl or slightly forward of that point. So there it is. A better toilet room layout. If you don’t have to lay out the powder bath room in the totally sucky traditional way, I would have you consider making a layout like this one the standard.